10+ days after Hurricane Maria slammed into the Virgin Islands and Puerto Rico, we find that 40% or more of the island does not have clean drinking water. This is a humanitarian crisis occurring on US soil.. There will be plenty of blame to go around on this one, but I ham a strong believer in the "Buck Stops Here" approach. The POTUS since the Hurricane hit the island has had a less than stellar response to the crisis, especially compared to the responses to Harvey in Texas and Irma in Florida. On September 17, the White House issued a disaster declaration in preparation for Maria. That was a good start, and in line with what the White House did in preparation with Harvey and Irma. Making a disaster declaration is one thing, acting upon it is where some of the problems lay. If you recall back to Hurricane Irma, many Caribbean islands took a direct hit from a Category 5 Hurricane that at the time had maximum sustained winds of around 185 miles an hour. Islands such as Barbuda were devastated, while the US Virgin Islands and Puerto Rico were severely crippled by the sideswipe of Irma. As the islands were beginning recovery from those storms, the tropical wave that eventually became Maria began heading that direction. Computer models were projecting that a major hurricane may go through the area several days in advance. Computer modeling for hurricanes have become pretty good to this point, and the US Virgin Islands and Puerto Rico were in the cone of uncertainty of a major hurricane (CAT 3+) either going over or passing close to these islands that were on the brink from Irma. This should have instigated major preparations on FEMA's part. The potential for major power and water distribution issues were high. The Federal government knew the economic and Commonwealth debt situations well in advance and the high likelihood that the Federal assistance would be great in this case. Like with Harvey and Irma, resources should have been in place ready to move once the storm had passed. While the power issue will take time (no doubt), shortages of food, medicine, fuel (for generators), and water should have been easily anticipated. Resources should have been at the ready, and all the red tape inhibiting the distribution and delivery of said resources should have already been cut through. No excuse in over preparation in a possible humanitarian crisis. The victim blaming, party bickering, and posturing by POTUS needs to stop now. 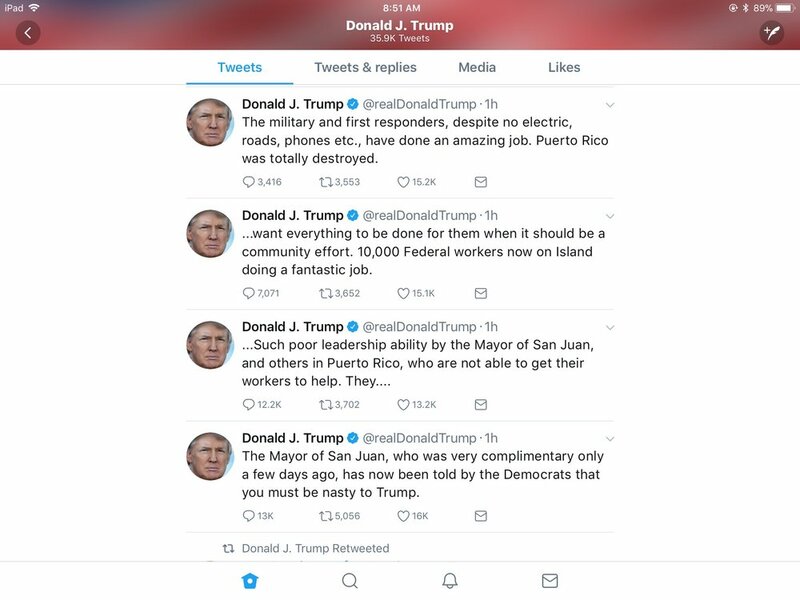 Earlier today, he sends out the following set of tweets about Puerto Rico. This is victim blaming at its finest. The general that is in charge of the relief effort states he does not have enough resources. Mr. President, it is not about Democrats or Republicans, nor about the economic condition of the island prior to the onslaught of 2 major hurricanes. It is about the 3.5+ million AMERICAN CITIZENS that live in Puerto Rico and the US Virgin Islands. We have the means and the the will to help out our fellow citizens as was done in the wake of Harvey and Irma. The buck stops with you Mr. President. Start acting presidential and stop the partisanship. The American people, especially those in need in Puerto Rico and the US Virgin Islands deserve better.